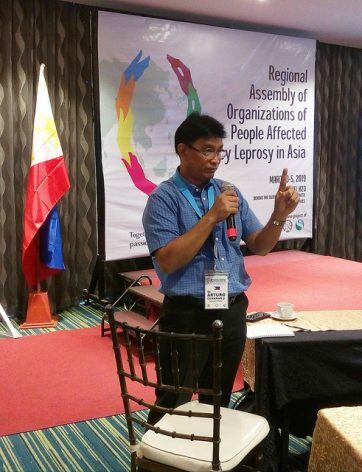 MANILA, Mar 5 2019 (IPS) - Organisations of people affected by leprosy in Asia have agreed to form a regional-level secretariat to support national advocacies and represent their collective agenda at a world conference to be held later this year. This was the most significant development to emerge from the Regional Assembly of Organisations of People Affected by Leprosy in Asia held in Manila from Mar. 3 to 5. The Coalition of Leprosy Advocates of the Philippines (CLAP) was selected by the delegates to serve as the first regional secretariat. Sasakawa Memorial Health Foundation (SMHF) Executive Director Dr. Takahiro Nanri requested that the first major initiative of the secretariat be the formulation by June of a “road map” encompassing the Assembly’s consensus agenda, which would then be used by the SMHF and it’s parent body the Nippon Foundation (TNF) to help develop the programme for the world leprosy conference to be held in September. SMHF and TNF convened the regional assembly in partnership with CLAP and the Culion Sanitarium and General Hospital (CSGH). CSGH chief Dr. Arturo C. Cunanan told the delegates assembled for the final day of the conference that, “putting our partnerships beyond these walls, putting it into action, is the big challenge” faced by the national organisations, who represented the Philippines, Indonesia, Nepal, China, and Kiribati. Cunanan, who is considered the Philippines’ foremost leprosy expert, was particularly upbeat about the conference’s focus on improving communications to stakeholders. “One of the most valuable things to come out of this conference is the learning about social marketing, and what interventions we can use,” Cunanan stressed to the attendees. Another key takeaway from the conference, Cunanan said, was the recognition of economic opportunity as a vital component of social inclusion strategies for people affected by leprosy. Cunanan pointed out that priority complemented the focus on organisational sustainability, which was an emergent theme at the conference. “It is very similar to the same thinking that organisations need to find income-generating programmes to be sustainable,” Cunanan said. Reiterating the point he made to the assembly, he added that the goal for the organisations should be to put “theory into practise” and develop practical actions from what they learned. Starting with an overall theme of “improving social inclusion,” the Regional Assembly of Organisations of People Affected by Leprosy in Asia at the outset identified four areas for discussion: Preserving the history of leprosy and its treatment; defending human rights and eliminating the stigma associated with leprosy; improving the delivery of public health services; and sustainability of the organisations. The consensus among the participating organisations was that sustainability was indeed a critical priority, and perhaps the most significant challenge faced by leprosy advocacies at the national level. Another key national-level agenda item agreed by the conference attendees was the need to improve networking with their respective governments, as well as other key organisations. In line with this, developing strategies to improve organisations’ public image, branding, and their marketing efforts was also acknowledged as an important objective for national organisations. During the conference, the importance of understanding and developing effective social marketing was stressed, both through the use of social media and more conventional practises. The development of a regional secretariat was considered the most important objective at a collective level. 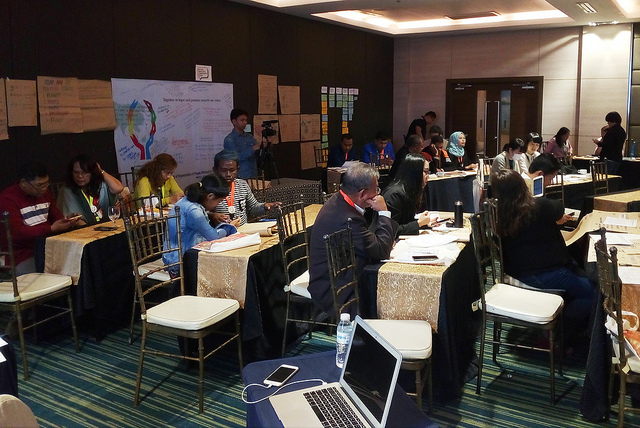 The conference participants echoed the sentiments of CSGH’s Cunanan that the shared ideas developed over the three days of talks should not be allowed to “dissolve” when the organisations return to their home countries. Conference attendees also agreed that creating a “sustainable development strategy” on a regional basis should be prioritised going forward, taking into account the need to strengthen national organisations as well as the regional group. Just what that strategy would entail, however, is still subject to discussion among the various groups. Capacity building, improving the organisational and managerial capabilities of national organisations, also emerged as a regional agenda. During the conference, capacity building was expressed as a significant concern for many organisations, since many of their members lack relevant work experience or education. A regional strategy could help pool talent resources among the Asian organisations, at least until some of their own people could gain more experience. The development of a regional framework and individual national agendas made the first Regional Assembly of Organisations of People Affected by Leprosy in Asia a success, conference facilitator Joseph “Boyet” Ongkiko told IPS. Nanri told IPS that much still needs to be done. “There’s a big difference between elimination and eradication. As of today, most countries have eliminated leprosy, but it has not been eradicated yet as new cases continue to appear. To eradicate, what we need is one last big push – or re-activate public attention to leprosy,” he said, adding that until now the information around leprosy has not been well presented.